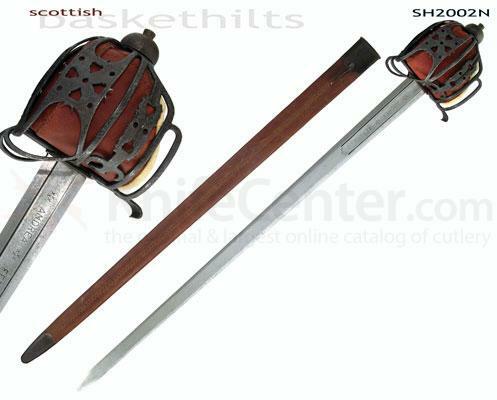 Its the Hanwei Scottish Basket Hilt Broadsword the antiqued version of the three kinds. The blade should have the inscription of the name Andrea Ferara. And the sword should have an overall Antiqued finish. The blade is discontinued but maybe someone here knows someone who does have one to offer. I wonder if there's someone here in this forum who can offer you this type of sword. I think Hanwei took the antiqued version of this sword as well as the backsword out of their catalog several years ago. I suggest you put a wanted notice in the "marketplace" section of this forum. If someone knows differently please respond to the OP. Lin is correct. It's discontinued. I had one years ago - liked it. The regular version is still available, AFAIK. I had picked up some Caswell stainless blackener and it works out ok. The regular backsword is still listed as a stock item.